2016 "Party like a Pirate!" Mudbugs, shrimp, crawfish, jambalaya, etouffee, andouille and gumbo, cajun, creole and zydeco, French Quarter, Big Easy, pralines and beignets. . . Words that evoke a sense of New Orleans. A city that entices many a traveler, yet sits over 1600 miles away from here! 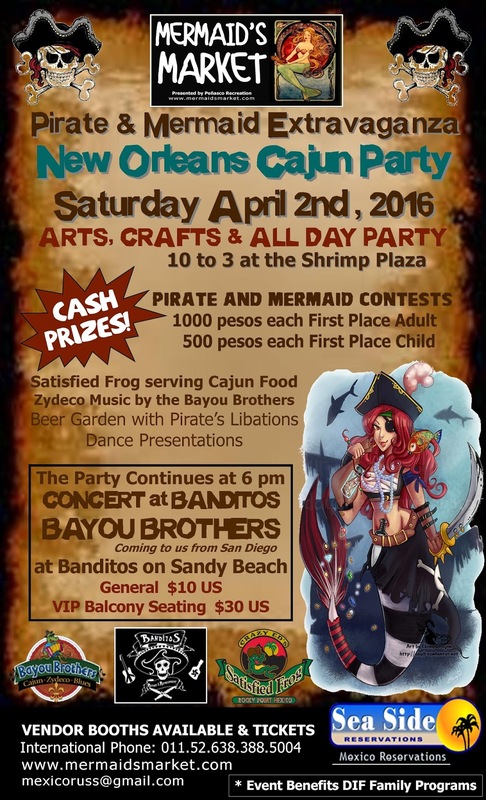 On April 2nd, the Pirate and Mermaid Extravaganza bring the tastes of a New Orleans Cajun party to Peñasco with pirates and mermaids galore. The Mermaid’s Market is in its 4th year and has become known as a local marketplace to find unique and eclectic ‘mermaid treasures’. . . gifts, clothing, candy, home decor, paintings, photographs and more. Each 1st and 3rd Saturday (during the months of October through April) you can find ‘mermaids’ selling their wares at the Shrimp Park in the center of Rocky Point. As part of its spring events, the Mermaid’s Market will present the 3rd Annual Pirate and Mermaid Extravaganza with fantastic food and drink, arts and crafts along with great music. This has become a popular event! This year, it is scheduled early in April with the hope that even more of our winter visitor friends will still be in town to enjoy the party! 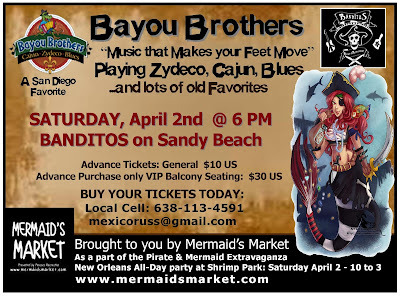 Back by popular demand is the phenomenal music of San Diego’s favorite zydeco band, Bayou Brothers. 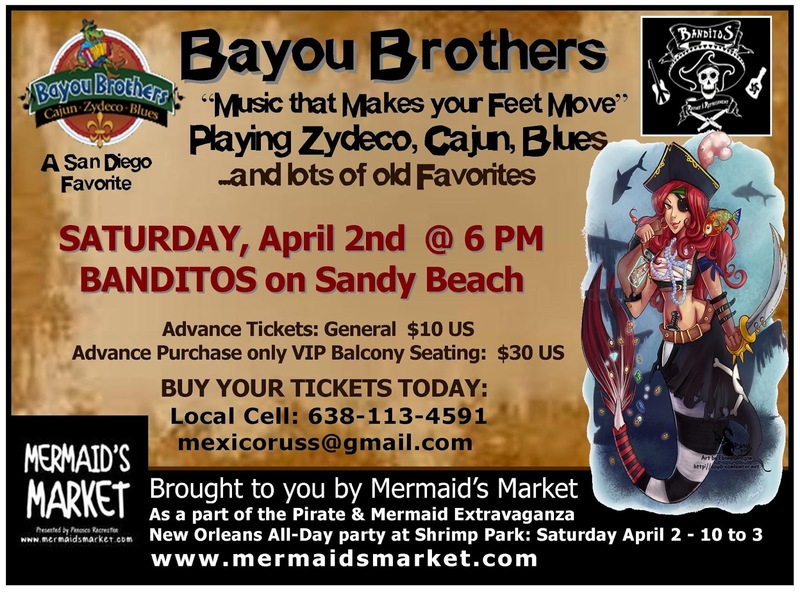 Playing both Cajun and Zydeco, the Bayou Brothers’ sound is straight out of Louisiana's bayou festivals and backyard crawfish boils! Their endless enthusiasm always promises to deliver a rousing, rollicking, foot stompin' musical gumbo you will not soon forget! Their performances will be a highlight of the Pirate and Mermaid Extravaganza (presented by Penasco Recreation). Get your first taste early in the day as the band plays a set at the park. Then join us for a fantastic evening presentation at Banditos! The evening show will begin early at 6 pm. Tickets are $10 and are available at both Mermaid’s Markets in March. Winners of the San Diego Blues Festival, you will not want to miss the Bayou Brothers. You just cannot keep your feet still when you hear their music! Another highlight will be the delicious Tastes of Louisiana from the Satisfied Frog Restaurant served up all day at the park! 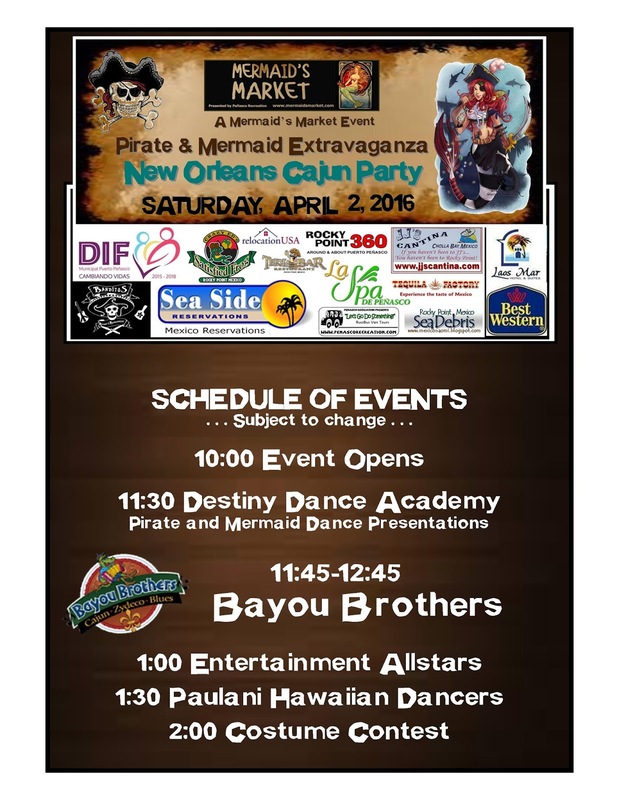 These Pirate and Mermaid cooks will be dishing up seafood and chicken and sausage gumbo, featuring their own hand-crafted Cajun andouille sausage served in a bowl with rice and garnished with chopped green onions. Always a huge draw, they will also have a Rocky Point Shrimp Boil with corn, new potatoes and whole heads of shrimp, boiled with garlic. With Crazy Ed's Original Chili Beer Hot sauce and Louisiana Hot Sauce on hand to kick things up a few notches for those who like it hot. So . . . The Pirate and Mermaid Extravaganza – A New Orleans Cajun Party. Now, doesn’t it just sound like fun? Besides the Mermaid's "treasures" that you normally find at the Mermaid's Market, we will have additional vendors on-site along with a Beer Garden for Fun drinks (Blue Mermaid Margaritas or New Orleans style Hurricanes). We will have our returning Mermaid, Michelina on site selling mermaid tails in case you need to get in the mood! The Costume contests for adults and children returns. This year, the winners will win CASH and Prizes. “Whoo-hoo!” So, dress as a Pirate or a Mermaid. Destiny Dance Academy has promised us a pirate dance presentation. All in all, it will be a great day to eat, drink, shop, dance, dress-up, and pretend. . .to just be a kid at heart. The date is April, 2nd - Mark your calendar! Once again we have 5 "Friends of the Mermaids" available. Mark your calendars and keep in contact for more details! CLICK TO RESERVE TICKETS NOW!